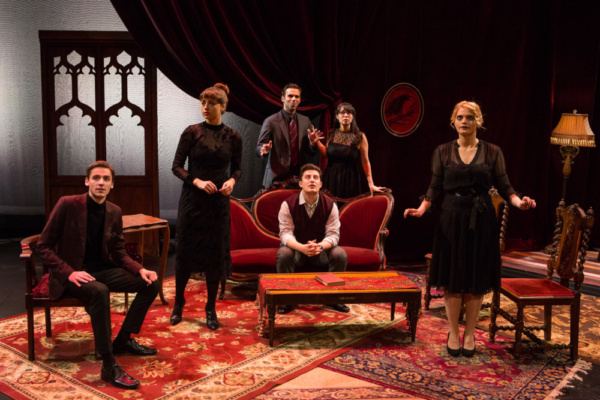 Yonder Window Theatre Company presents a delightful production of The House on Poe Street. While the finer points of the story are dubious, the show is beautiful, engaging and strange. 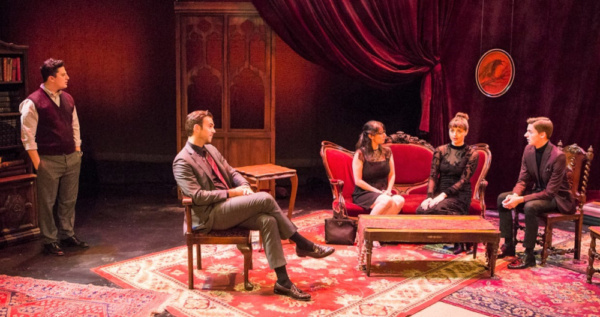 Estate lawyer Mendel Steingold (Gregory Jensen) meets an interesting pair of twin sisters, Argonne and Flourine Seaborg (Olivia Nice and Eliza Shea, respectively), while handling the estate of their deceased mother, Dr. Seaborg. The house is reportedly where Edgar Allen Poe wrote The Raven, and the twins discuss their hopes to turn the old house into a museum dedicated to Poe’s work. They also talk about their mother’s experiments to find an “empathy gene.” She hoped to find create or find a hormone that would rid the world of male aggression by injecting the hormone into world leaders, and men in general. Mendel of course doesn’t find this appealing, and the quirky sisters soon run him ragged with their peculiar demeanor. At their request, Mendel introduces them to his fiancé, Samaria Silverman (Tamara Geisler), and the three ladies become fast friends. Despite his reservations about the twins, Mendel also introduces them to Sam’s brother Lawrence (Gadi Rubin) and his friend, Astin Rutherford (Daniel Light). As they spend more time together, they discover the presence of a ghost who leaves a strange substance in tea cups at night. After an attempt to speak with the ghost through medium Lithia Nickels (Laura Johnston), Mendel’s world begins to crack as he is forced to examine his world view. The scenic design by Pei-Wen Huang-Shea is lovely. It really brings the parlor of an old house to life – a lived in house full of character and story. In this charming setting, director Katie McHugh makes stage pictures that reflect the characters’ power and peculiarities as they tell their fantastic story. Olivia Nice and Eliza Shea are the heart and soul of the entire performance. They are lovely to watch. Their timing with each other, and moving and speaking in unison was impeccable. They have such great chemistry, their singing voices are well matched. At several points throughout the show, Olivia and Eliza sing harmonies composed by Sheilah Rae. The lyrics are poetry by Poe and his wife, giving the gentle lilt of the melodies an eerie feel. Gregory Jensen drives the play with ease, though it is a pity that his character has less and less to offer him as the action of the play moves forward. The rest of the actors do what they can with their two dimensional characters. Tamara Geisler fills out her character rather well. Laura Johnston and Daniel Light both have undeniable stage presence and a knack for the details of their characters. Fengar Gael crafts an intriguing story and impeccable dialogue, however, most of the play is exposition. While the device she uses to tell the story is successful, it also means that we do not get to see all the action of the two stories we are being told. This feminist sci-fi is told through Mendel’s eyes, and Mendel is a man unaware of his privilege and power – the type of person the Seaborg sisters wish to eradicate. Naturally the characters clash, but because Mendel is telling the story, we follow his plot line. As a result, the climax of the twin sisters’ story takes place in the two months that Mendel is absent. It is odd that we learn so much about the peculiar lives of the Seaborg sisters, yet in the end the story doesn’t really seem to be about them. Some moments of the play feel unfinished. For example, the result of the séance is the discovery of an oblong box that hold bones, potentially belonging to Virginia Clemm Poe; but this discovery does not propel the plot in anyway. It is like an empty Easter egg – it was so compelling to find it only to understand it doesn’t hold any meaning. I rather enjoyed the story and the performance, yet I find a bizarre irony in the fact that a story about two very strong female characters surrounded by subpar characters is told from the perspective of a two-dimensional male character. 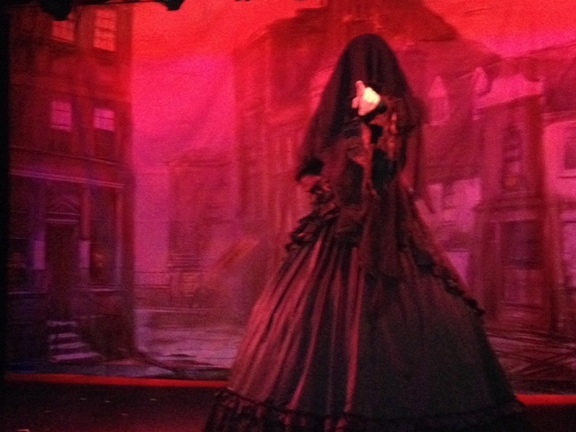 The House on Poe Street, Yonder Window Theatre Company, 14th Street Y Theatre, 344 East 14th Street. Closes November 12. Some plays are big, on the grand scale of an epic. Other plays are tiny, occupying the infinite and narrow space between two people. Party Play, an original production by Valerie Work and directed by Molly Marinik, is in the latter category -- placing the microscope on a small circle of friends, in a microcosmic world, for a narrow sliver of time. Playing at the Brick through tomorrow, it's a simple story of loss, quiet suffering, and human beings drifting apart. As you might expect with a play of such specific focus, the plot is quite simple in scope. Two friends, Paul (Joe Gregori) and Carl (William Barnet) (pictured above), have shared a popular party apartment somewhere in Brooklyn. Now, the party is over in a larger sense -- Carl has run out of money and is going to move in with his parents in Rochester, NY. Paul is staying in Brooklyn, but moving to a small apartment where, sadly, the party will no longer be continuing. Their mutual friend Dustin (Greg Carere) has been handed "the party baton", but there are serious doubts as to whether he can live up to their raucous past. The play takes place over the night of a single party, the last party, unfolding from end to beginning (Memento-style, if you prefer). The two are going through the motions, welcoming their usual cast of friends -- Kiki (Caitlin Goldie) and Janalyn (Charlotte Arnoux). And, talk of the evening, Tamar (Sarah Poleshuck) is making an appearance, having fallen by the wayside during her marriage... which has just ended in an uncomfortable divorce. Tamar, Paul, and Carl are each in transition to new homes, both literally (Tamar is also experiencing the stereotypical pains of NY real estate) as well as metaphorically (Janalyn candidly let's slip that when people are away for months it's like they've disappeared for years). The experience is extremely laser-focused: it's a specific moment in history (it could only be this Millennial moment in Brooklyn, layered over with the pop music and references of our time), in time (unfolding backwards over one night, with the narrative focus almost solely on that night's experience), and in space (the only recognizable outside world referenced is the mythical Rochester, NY). It's told through a theatre-verite, moment to moment the conversations have an effortless unforced realness which, when they are not overburdened with forced meaning, feel like reality. Unlike your typical, twentieth century "realist" play, this doesn't culminate in explosive monologues -- Tamar never explodes with rage or collapses in tears at the tiny, paper-cut-like slights that her awkward friends send her way, nor does anyone on stage truly speak aloud their fears or pains at any point. We assume that still waters run deep, although in fact all we are seeing are, well, still waters. You may be distracted from the stillness of the waters by innovative use of direction, music, and design that keeps the play moving as its story unfolds. Lee Kinney's sound design keeps the flow moving, tying into the on-going party pulse that drives the narrative forward. Molly Marinik's direction finds new ways to use space to keep the play's low-key, realist dialogue from falling into a repetitive lull. This is where I caveat for a moment my relationship to a play called "Party Play" when I'm not someone who particularly likes parties or alcohol. So from where I sat, Party Play seemed like a dispassionate, almost anthropological assessment of the white American party culture in Brooklyn today. If so, I would say that both the form and the content point towards something severe that's missing in these aimless youth's lives. (Boy howdy I'm about to get all old man up on this review). The big problem for Carl, for Paul, and for Tamar is that they've built a social circle around "having fun." Thus, when some non-fun things happen - Tamar's divorce, for example - the friends at hand can't seem to find any way to provide comfort, or to truly connect with this pain. Instead, it becomes a source of quiet shame. The real doubt, hanging over the play, is whether any of the people we're watching are going to be in touch after the party ends. It's difficult to see what they have in common aside from shared memories of wedding parties and after parties, waterslide parties, pool parties. Once the party is gone, what will be left? Certainly, nobody wants to talk about it. And while the party is going, nobody has to. Tellingly, the two moments when someone addresses the elephant in the room are both Carl, at the beginning and end at the play -- expressions of longing for the past, and fear of the future. A mournful goodbye to a pleasant adolescence. In addition to that evocative backdrop, scenic designer Pei-Wen Huang also creates a lovely sense of time and place with simple furnishings and objects. “Darkness is cheap. I like it,” explains Scrooge to the ghost of his deceased business partner during an early scene in this version of A Christmas Carol. Marley has just spookily entered from a trapdoor in the center of the dimly lit stage. The dynamic, large, bearded, African-American performer, Jonathan Rion Bethea, in a three-piece white suit, and wrapped in the requisite chain, is chilling. His lecture to Scrooge leads to a Fossesque, eerie, song and dance number where several darkly masked spirits holding chains join him, that is riveting. Choreographer and performer Emily Madan’s inspired work is also in evidence in several other sequences including equally effective numbers for the wretched duo of Want and Ignorance, and the imagined events after death of Scrooge. Charles Dickens’ classic novella is being given a delightful and boisterous musical adaptation, presented by Be Bold! Productions and the Players Theatre. Children and adults will be greatly entertained by this brisk production that captures the spirit of the story with much comedy, drama, and unique musical accompaniment. Britton Matthews and Emily Sgouros join music director and key boardist Michael Sgouros on percussion. This team creates wonderful music and sound effects from more than twenty instruments including cymbals, a cowbell, a slide whistle and sleigh bells. The engaging score is mixture of traditional songs such as “Deck The Halls,” “Jingle Bells,” and “Joy to The World,” as well as several fine original ones. Michael Sgouros composed these, with lyrics by Brenda Bell. Dressed in authentic-looking Victorian era costumes, the multi-racial cast of 11 adults and 7 children (from a rotating ensemble of 25) are wondrous. Seeing and hearing them bustling up and down the theater’s aisles, singing carols, banging cymbals, and performing on the small stage with its 1840’s line-drawing London street backdrop, is joyous and truly Dickensian. Among the accomplished vignettes are a boy in a furry dog costume being walked, and a moving meeting of the young and old Scrooges. In addition to that evocative backdrop, scenic designer Pei-Wen Huang also creates a lovely sense of time and place with simple furnishings and objects. With occasional red hues, shimmering blackouts, and other striking effects, lighting designer Rome Brown’s work is integral to the show’s compelling visual quality. Eric Fletcher’s glorious performance as Scrooge is in the grand tradition of Great Hams such as Monty Woolley, Vincent Price and Victor Buono. Like them, he skillfully tones it down at the appropriate times to achieve great emotional reality and pathos. Other standout performances from the company include, Tyler Nye in the dual roles of Scrooge’s nephew and Fezziwig. With animated facial expressions and vocal delivery he is charmingly comic and effectively dramatic. Evan Fazziola and Bekah Shade are an earnestly sweet and poignant Bob and Mrs. Cratchit. Recalling the comedic talents of Tracey Ullman and the persona of Helena Bonham Carter, Brianna Hurley is marvelously droll as “Agy,” and as the spritely Ghost of Christmas Present. She hilariously begins the proceedings by delivering the kooky, anachronistic, pre-show announcements. Though phone calls are not permitted, the audience is encouraged to keep their smartphones out to take pictures to post on Instagram, with the hashtag #Agysays. The mastermind behind this enchanting show is Brenda Bell. Besides writing the well-crafted lyrics for the new songs, she also wrote the clever book that faithfully embodies Dickens’ sensibility with numerous offbeat touches. She has made it fresh for those familiar with the story, and a great introduction for those who might be experiencing it for the first time. As the director. she has superbly coordinated all of the production elements, staging, and performances into a beautiful event. At the performance attended, she also adeptly played The Ghost of Christmas Past with abundant warmth, and was in the ensemble throughout. Associate Professor Victor "Kip" Marsh, chair of the Department of Theater, and M.F.A. theater design student Pei-Wen Huang present the work of Brooklyn College students at the Stage Design Exhibition of International Theatre Schools in Shanghai. Victor "Kip" Marsh, associate professor and chair of the Department of Theater, and M.F.A. student Pei-Wen Huang travelled to Shanghai in October to represent Brooklyn College at the biennial Stage Design Exhibition of International Theatre Schools. Students from around the globe attended the weeklong conference, which aims to bring academic institutions together to share expertise on art and stage design. "The works we brought to Shanghai were very energetic," says Huang, who hails from Taiwan. "All the pictures from the shows really express the range of American theater." Huang, who is studying theater design, helped Marsh to organize the trip and secured a student travel grant through the college to cover her travel expenses. Her fluency in Mandarin was also a plus. Brooklyn College was the only American school invited to participate in the exhibition, which was hosted by Shanghai Theatre Academy (STA) and held at the Shanghai New International Expo Center. STA is one of the largest universities for performing arts in the world. "It is safe to say that our students' stage design work was among the best presented at this exhibition," says Marsh, who also gave a lecture on American stage design methods. "The event was a way to get people from across the world to analyze stage design from a global, social and political perspective." This fall, Brooklyn College and STA formed a partnership that will provide exchange opportunities for students and faculty. "The departments of theater, film, and television and radio all represent positions of excellence to Shanghai Theatre Academy," says Marsh. "Our master's programs in all areas are quite strong, and our direct access to the New York entertainment community is also attractive." Marsh joined the Brooklyn College faculty in 2004. He is also a principal lighting and set designer with the acclaimed dance company Les Ballets Trockadero de Monte Carlo, and he has worked on a number of theatrical projects, including Nora Ephron's "Imaginary Friends" and "The Contract" at the National Ballet of Canada. Huang has received numerous awards for her work in the arts, including the Frances Black prize in drama, Jack Hilton Cunningham Award in Scenery Design, and Friars Club Foundation Scholarship. After she graduates, she plans to pursue a career in set and costume design. Posted:Thursday, March 1, 2012 9:00 am |Â Updated: 10:00 pm, Wed Feb 29, 2012. The cataclysmic events surrounding the Nazi takeover in Germany reach an agonizing crescendo in Pulitzer Prize-winning playwright Tony Kushner™s intense drama A Bright Room Called Day. Presented as theatre-in-the-round on Brooklyn College™s Whitman stage, the battle between the conservative right and the radical left is the unabashed theme of the production. The line between harsh reality and bizarre fantasy is intentionally blurred by the author and reinforced by the actors. Emily DeSena plays Zillah, a 1980s protester who sits unseen with the 1930s activists. Her righteous indignation and frequent anti-establishment hyperboles are well played. The Devil, or one of his incarnations, appears from the mist as Gottfried Swetts (Skyler Sullivan), an importer of Spanish novelties. He offers a unique gift to the stunned radicals. The last mystical character is Die Alte (the old one) portrayed by Layla Khoshnoudi. She enters through the fire escape, bewildered and bedraggled. She represents the silent majority of 1930s Germans who were unwilling or unable to stop the flood of horrors triggered by Hitler™s henchmen. The playwright's parallels to the Ronald Reagan era seem somehow less potent in light of more current conservative movers and shakers. Fiery Gotchling played by Sarah Poleshuck is quite convincing as a strong woman willing to take enormous risks. Equally persuasive is lovely starlet Paulinka (Amanda Holston) who is addicted to opium and psychotherapy. She stumbles into action defending her friend against Nazi thugs. One eyed Husz (Marcus D. Harvey) explodes with anger when Gregor Bazwald (J.J. Condon) describes his chance meeting with Hitler. Husz rails, Why didn't you shoot him. You had a gun!â€ Both flee the country. Communist activists Rosa (Bree Klauser) and Emil Traum (Jordane Christie) also plan to escape. Kristi Funk Dana plays Agnes, an actress who is sympathetic but not wholly committed to leftist ideologies. Ms. Dana is the hub around which all other characterizations turn. She sees and understands what is happening in her homeland but is helpless or unwilling to prevent the evil momentum engulfing her country. Directed by Dave Dalton with outstanding set design by Pei-Wen Huang, the play runs until March 4. Call the Brooklyn Center at 718-951-4500 for tickets or check the webpage at http//depthome.brooklyn.cuny.edu/theater. Brooklyn stages continue to bring light to dark wintry days. As always, save me a seat on the aisle. STATEN ISLAND, N.Y. -- CSI's Department of Performing and Creative Arts' presentation of "The Pearlfisher" was a visual beauty. The highlight was the river banks which was presented as an architectual gem in wood-framed multi-level-real-water banks in Pei-Wen Huang's design. 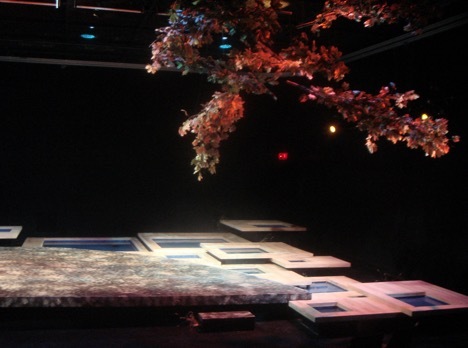 Leaves on the trees cast a perfect shadow on the set and even change colors through the seasons with Michael Deegan's lights. It all made for a gorgeous playing area for the five-member cast, Danielle Hernandez, Steven Hudacko, Alison Langleiben, Thomas Reilly and Omar Sattar, who are all convincing in their roles which also required they mix languages like farsi. Maurya Wickstrom directs a tender love story/struggle for preservation. Iain MacLeod's Scottish play takes a look at life through nomadic Travellers who contend with nature, locals and stereotypes to earn a living. Presented in two acts, MacLeod sets up the story in 1948 and then revists the players nearly 50 years later. Steven Hudacko is the Act I pearlfisher who finds tiny gems in the fresh water river to be sold. Hudacko, who also pulls double-duty as assistant director is quite capable as the respectful, honest and caring fisherman who befriends a young woman, Jess (Alison Langleiben) who appears to be in a loveless relationship with Roderick (Thomas Reilly) always ready to pick a fight and benefit from work he has not done. Joining the pearfisher as traveller is Etta (Danielle Hernandez) who sells flowers and Willie (Omar Sattar) who trades and rides horses. 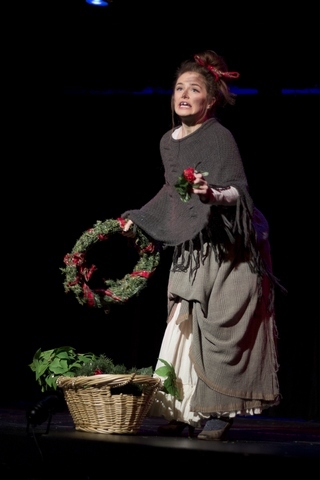 Langleiben's Jess is a stage natural and falls in love with Ali and risks being shunned by family and likely suitors. She then fears for her future and the future of her offspring. In the second act we see the off-spring who now live in trailers and still are in fear of their lifestyle and livlihood. Hernandez is the steady carry-over from act one who tells the story of what happened with the pearlfisher. The biggest challenge was in scene changes that required crew members to carry on furniture and props. While the crew did a fine job in making changes quickly, their presence interrupted the flow of action and thus momentum, especially in the quick transition scenes.